Embedded Data: A DVD-R disk (also applies to DVD+R) which still has space available. Data is burned onto the disk with a writing laser. DVD recordable and DVD rewritable refer to part of optical disc recording technologies. DVD optical disc formats that can be recorded by a DVD recorder, (written, "burned"), either write once or rewritable (write multiple times) format written by laser, as compared to DVD-ROM, which is mass-produced by pressing, primarily for the distribution of home video. DVD recordable is a general term that refers to both write-once and rewritable formats, whereas DVD rewritable refers only to rewritable formats. Like CD-Rs, DVD recordables use dyes. Depending on the intensity of the laser, the reflective property of the dye on a particular spot will determine whether it is a peak or a valley representation from pressed DVD. Dyes give the data side of a disc a distinct color. Dyes are also the reason playback is not guaranteed. Their reflective properties are not as good as with stamped DVDs that commonly have aluminum as the reflective layer. The larger storage capacity of a DVD-R compared to a CD-R is achieved through smaller pit size and smaller track pitch of the groove spiral which guides the laser beam. Consequently, more pits can be written on the same physical sized disc. In order to write smaller pits onto the recording dye layer, a red laser beam with a wavelength of 640 nm (for general use recordable DVD, versus a wavelength of 780 nm for CD-R) is used in conjunction with a higher numerical aperture lens. Because of this shorter wavelength, DVDs use different dyes from CDs to properly absorb this wavelength. The "R" format DVDs can be written once and read arbitrarily many times. Thus, "R" format discs are suited to applications such as non-volatile data storage, audio, or video. This can cause confusion because the DVD+RW Alliance logo is a stylized 'RW'. Thus, a DVD+R disc may have the RW logo, but it is not rewritable. According to Pioneer, DVD-RW discs may be written to about 1,000 times before needing replacement. RW discs are commonly used to store data in a volatile format, such as when creating backups or collections of files. They are also used for home DVD video recorders. One benefit to using a rewritable disc is if there are writing errors when recording data, the disc is not ruined and can still store data by erasing the faulty data. 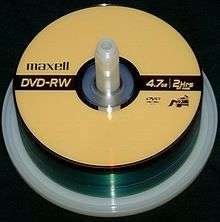 The DVD-R format was developed by Pioneer in 1997. It is supported by most normal DVD players and is approved by the DVD Forum. Has broader playback compatibility than the "+" especially with much older players. The dash format uses a "land pre-pit" method to provide 'sector' address information. DVD "minus" R is not correct, according to DVD-R consortium recommendations; it is, in fact, a dash (i.e. DVD "dash" R). DVD-R and DVD+R technologies are not directly compatible, which created a format war in the DVD technology industry. To reconcile the two competing formats, manufacturers created hybrid drives that could read both — most hybrid drives that handle both formats are labeled DVD±R and Super Multi (which includes DVD-RAM support) and are very popular. As of 2006, the market for recordable DVD technology shows little sign of settling down in favour of either the plus or dash formats, which is mostly the result of the increasing numbers of dual-format devices that can record to both formats. It has become very difficult to find new computer drives that can only record to one of the formats. By contrast, DVD Video recorders still favour one format over the other, often providing restrictions on what the unfavoured format will do. However, because the DVD-R format has been in use since 1997, it has had a five-year lead on DVD+R. As such, older or cheaper DVD players (up to 2004 vintage) are more likely to favour the DVD-R standard exclusively. There are a number of significant technical differences between the 'dash' and the 'plus' format, although most users would not notice the difference. One example is that the DVD+R style address in pregroove (ADIP) system of tracking and speed control is less susceptible to interference and error, which makes the ADIP system more accurate at higher speeds than the land pre pit (LPP) system used by DVD-R. In addition, DVD+R(W) has a more robust error-management system than DVD-R(W), allowing for more accurate burning to media, independent of the quality of the media. The practical upshot is that a DVD+R writer is able to locate data on the disc to byte accuracy whereas DVD-R is incapable of such precision. Like other 'plus' media, it is possible to change the book type to increase the compatibility of DVD+R media (though unlike DVD+RW, it is a one way process). This is also known as bitsetting. As RAM stands for Random Access Memory, it works more or less like a hard-drive and was designed for corporate back-up use. Developed in 1996, DVD-RAM is a rewritable optical disc usually encased in a cartridge. Currently available in standard 4.7 GB (and sometimes in other sizes), it is useful in applications that require quick revisions and rewriting.Can only be read in drives that are DVD-RAM compatible. DVD Forum backs this format. DVD recordable media are sold in two standard sizes, a standard-sized 12 cm size for home recording and computer usage, and a small 8 cm size (sometimes known as a miniDVD) for use in compact camcorders. The smaller Mini DVD-RW, for example, holds 1.46 GB. Disk write time in table does not include overhead, leadout, etc. The write time may vary (± 30 s) between writer and media used. For high speed, the write strategy changes from constant linear velocity (CLV) to constant angular velocity (CAV), or zoned constant linear velocity (ZCLV). The table below largely assumes CAV. DVD-R discs are composed of two 0.6 mm acrylic discs, bonded with an adhesive to each other. One contains the laser guiding groove and is coated with the recording dye and a silver alloy or gold reflector. The other one (for single-sided discs) is an ungrooved 'dummy' disc to assure mechanical stability of the sandwich structure, and compatibility with the compact disc standard geometry which requires a total disc thickness of about 1.2 mm. The sandwich structure also helps protect the data containing layer from scratches with a thick "dummy" disc, a problem with CDs, which lack that structure. Double-sided discs have two grooved, recordable disc sides, and require the user to flip the disc to access the other side. Compared to a CD's 1.2 mm thickness, a DVD's laser beam only has to penetrate 0.6 mm of plastic in order to reach the dye recording layer, which allows the lens to focus the beam to a smaller spot size to write smaller pits. In 2011, JVC announced an archival DVD recording media manufactured with quality control and inspection frequencies techniques greater than is traditionally used in media manufacturing, and using specially developed silver alloy as a reflective layer and organic dye with in-house developed additives to secure long-term data retention. A specification for dual-layer DVD-RW discs with a capacity of 8.5 GB (8,500,000,000 bytes) was approved by the DVD Forum, and JVC announced their development of the first media in the format in 2005. However, manufacturing support for these rewritable dual-layer discs did not materialize due to costs and expected competition from newer and higher-capacity formats like Blu-ray and HD DVD. A double-layer DVD+RW specification was approved in March 2006 with a capacity of 8.5 GB. Manufacturing support for rewritable dual-layer discs exists today. ↑ "Pioneer Announces New, Lower Prices for DVD-R and DVD-RW Media". Pioneer Electronics USA. ↑ "History". EU: Pioneer. Retrieved 2008-12-02. ↑ "80 mm (1,23 Gbytes per side) and 120 mm (3,95 Gbytes per side) DVD-Recordable Disk (DVD-R)" (standard). ECMA. December 1998. 279. Retrieved 2013-01-29. ↑ "Data Interchange on 120 mm and 80 mm Optical Disk using +R Format – Capacity: 4,7 and 1,46 Gbytes per Side (Recording speed up to 16×)" (standard) (4th ed.). ECMA. June 2008. p. 4. 349. Retrieved 2013-01-29. 1 2 "DVD6C Announces New Licensing Program". DVD6C LA. Retrieved 2008-01-25. ↑ DMR-EX769 (user manual), Panasonic, Machine will not record 16:9 format video to DVD+R(W) . ↑ "What is DVD?". Video help. Retrieved 2008-07-23. ↑ McFarland, Patrick (October 30, 2006), How To Choose CD/DVD Archival Media, Ad terras pera spera . ↑ "Increased compatibility: DVD bitsetting". CD freaks (review). Archived from the original on July 24, 2008. Retrieved 2008-09-15. 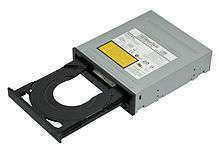 ↑ "TEAC Corporation DVD/CD-Rewritable Drive Specification DV-W5500S-000 Rev. 0.94 1/24 DVD/CD-Rewritable Drive Product Specification Model : DV-W5500S-000 Drive Specification" (PDF). TEAC Corporation. Retrieved 30 January 2015. ↑ "Sony's 'miracle' DVD writer hits 24x write speed". TG daily. Retrieved 2009-02-26. ↑ The Byte Converter . ↑ "Understanding DVD". Optical Storage Technology Association. 2004. Retrieved 2008-09-06. ↑ CD-R and DVD-R RW Longevity Research, US: Library of Congress . ↑ JVC introduces archival grade DVD-R media, Broadcast engineering, November 23, 2011 External link in |publisher= (help). 80 mm (1.23 GB per side) and 120 mm (3.95 GB per side) DVD-Recordable Disc (DVD-R) (standard), ECMA, 279 . Data interchange on 120 mm and 80 mm Optical Disc using +R format (technical specification), ISO/IEC, 2005, 17344 . Data interchange on 120 mm and 80 mm optical disc using +R DL format – Capacity: 8.55 GB and 2.66 GB per side (recording speed up to 16×) (technical specification), ISO/IEC, 2008, 25434 .